On October 25, 2016, this year's winners in the Earth Observation (EO) competition, Copernicus Masters, were recognised by high-ranking industry and institutional representatives before an international audience in Madrid. Taking home the grand prize was the team around Grega Milcinski from Slovenia's Sinergise Ltd., whose Sentinel Hub—a cloud-based web service for satellite data—triumphed in the T-Systems Open Telekom Cloud Challenge before edging out the winners of the other six categories. 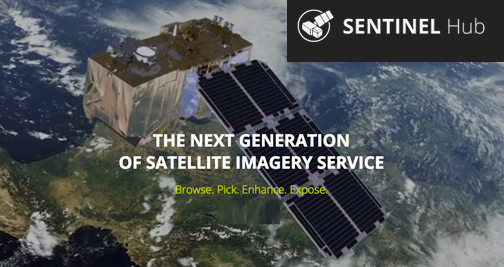 EO satellites, including the Sentinels of Europe's Copernicus program, produce tremendous amounts of data every day. This presents an enormous potential for scientific and commercial applications on the ground. However, downloading, processing, and storing petabytes of data has posed major challenges for many user groups. Sentinel Hub makes it possible to browse, process, and distribute large amounts of data quickly and efficiently—even for non-expert users. Thanks to Sentinel Hub's ability to integrate into any GIS or web application, this online service is poised to fundamentally affect the daily work routines of developers, scientists, and many other target groups. "According to a recent PWC study Copernicus has become the third largest data supplier in the world. Sentinel data access is full, free and open to all users world-wide. Sentinel Hub significantly simplifies the way users can access and process satellite data," said Dr. Josef Aschbacher, ESA's Director of Earth Observation Programs, at the awards ceremony in Madrid. 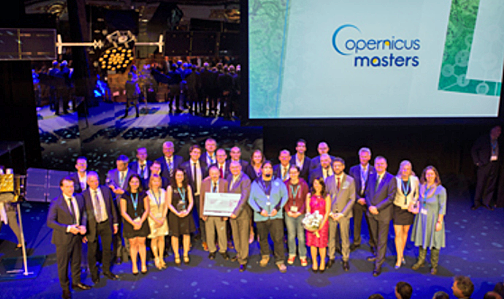 "With applications like these, the 2016 Copernicus Masters competition has once again clearly demonstrated its potential to drive the innovative use of Earth observation data and make the Copernicus programme accessible to new user groups." Having received a total of more than 900 ideas from over 70 countries to date, the Copernicus Masters has evolved into the leading international ideas competition for the nexgen of EO apps. Since 2011, the program has recognised each year's most promising and revolutionary innovations and business concepts. The 70 best applications produced through the Copernicus Masters and tje affiliated Space App Camps are now presented in the new ESA publication Copernicus in Action, in partnership with AZO. The University Challenge, meanwhile, was geared towards students and research assistants. Along with cash prizes, consulting and data packages, and other benefits, the winners will now have the opportunity to ready their ideas for the marketplace at one of the 16 ESA Business Incubation Centers across Europe. With financial support from the European Commission, the new Copernicus Accelerator will also invite 40 Copernicus Masters' finalists to take part in a tailored eight-months mentoring program that will help them advance their business ideas. In addition to highlighting the benefits Copernicus offers to a wide array of sectors, the winners of this year's seven Copernicus Masters challenges present further proof of the competition's ability to showcase market-oriented applications of Earth observation data. The Satellite Masters Conference has become a must-attend event for industries, scientists, and start-ups involved in the commercial use of EO and satellite navigation. Initiated by AZO, co-organized by madri+d and Comunidad da Madrid, and with support from Deloitte, the conference was held for the first time at Madrid's Circulo de Bellas Artes, providing a festive setting for the ceremony, as well. This year's winners had the chance to present their ideas to the international Earth observation and navigation scene and discuss innovations in space-based technologies and services with those in attendance. To learn more about the Copernicus Masters and this year's winners, visit the competition website at www.copernicus-masters.com. When NASA and USGS launched Landsat 8 a few years ago, it seemed that satellite imagery has finally opened a window for anybody to view Earth from space, and that was pretty cool. It gave us an image of every piece of the Earth every 16 days, and with some effort and quite a lot of bandwidth, one was able to discern the area he/she lives - from space. With a substantial amount of work one was able to see it better, squeezing the juice out of data by doing something experts know as pan-sharpening. However, a few months ago, ESA did something even better. Next in the line of space Sentinels, Sentinel-2, is bringing higher resolution images of the same area every 10 days (in Europe every week), a number that will even be halved by end of the year when another satellite will be added to the Sentinel-2 constellation. That means we can expect a new 10 meter, multi-spectral resolution capture of a location every few days in Europe. Sinergise decided it would be good to do something about all these problems—Sentinel Hub was born, trying to make it easier for a normal user (e.g., non-remote-sensing expert) to look through the space window down on Earth and to do something with that view. To demonstrate the technology, a dedicated app has been created—Postcards from space—that makes it possible for you to sift through Sentinel-2 data, searching for the beautiful views from space that have never been seen before. With tens of millions of square kilometers of area being added every day, the chances of finding a gem like this are much higher than that of finding a gem in your backyard.